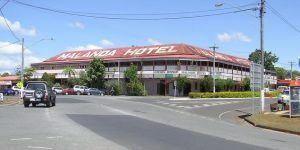 The Malanda Hotel is the most obvious landmark of the location, characteristically built from the timber of local trees. As you enter the restaurant section of the hotel, you will notice the prominence of these timbers, seen in the floorboards and the magnificent staircase (made from local Silky Oak) leading to the hotel rooms and second floor. The hotel serves a range of very tasty counter meals, reasonably priced, to be eaten with a selection of beers, wine, spirits or soft drink.